Ruth Davidson behind the counter at Fochabers Ice Cream Parlour. A Moray business owner has been forced to contact the police after being subjected to torrents of abuse. Sheila Gray, owner of Fochabers Ice Cream Parlour, feared her store would be “attacked” following a visit from Ruth Davidson. 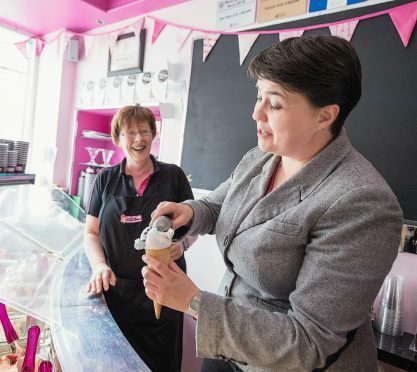 The Scottish Conservative leader visited the shop for a sweet treat in the prelude to the general election vote. But, in the days following the trip the parlour, which is recognised as one of the best in Scotland, was subjected to online abuse. Yesterday, Ms Gray revealed the messages had escalated to a point where she feared for the safety of her employees. She said: “It scared me. I was due to be out of the shop for a day and had to leave some of the younger members of staff on their own. “I had to get in some extra staff in case there was some nonsense while I was away. What worried me the most was that people in the village were posting some of the messages. Dozens of messages, which were sent to the firm, threatened a boycott of the store while others warned the popular shop could be targeted by “thugs”. Conservative councillor for Fochabers Lhanbryde, Marc Macrae, described the allegedly “cybernat” backlash against the firm as being “deeply disappointing”. He said: “It’s a widely recognised shop across the country. There’s a framed letter from SNP MSP Richard Lochhead on the wall. “Nicola Sturgeon visited the Aroma Cafe in Lossiemouth during the campaign but I’m not going to stop visiting it just because she’s been there.